The Atlantic has a special report with the unfortunate title How Genius Works. It begins with "Great art begins with an idea. Sometimes a vague or even bad one. How does that spark of creativity find its way to the canvas, the page, the dinner plate..." and a number of other places. T.C. Boyle, the one writer included, does a piece explaining how he does first drafts, which isn't bad, by any means, but what he talks about is the mechanics of revision. When I think about the spark of creativity finding its way somewhere, what I want to know is how a writer or some other type of creative person generate material from that original idea and develop it into a completed work. I need to know how Boyle came up with that page he then revised. A number of interviews with authors and illustrators conducted by Billie Levy for West Hartford cable television have been made available on-line through the Thomas Dodd Research Center at the University of Connecticut. Billie Levy is a big, big name in children's literature in Connecticut. She is a former children's librarian and a serious collector of children's books. She is one of the collectors who donated items from personal collections to help get the Northeast Children's Literature Collection started. In Billie's case we're talking a donation of 8,000 items. She continues to collect, and I often see her at children's literature events at UConn. Tbe best line in Colson Whitehead's essay Better Than Renting Out A Windowless Room: The Blessed Distraction Of Technology? "I am part of a vast and wretched assembly of freaks who are not fit for decent work and thus must write, or wither." That pretty much describes me in a sentence. In the last few years before I finally had a book accepted for publication, I realized that I couldn't stop writing because I'd invested too much time in it. I had spent so many years writing that there was now nothing else I could do. And if I never got published? Ouch. Michael Chabon writes about The Phantom Tollbooth in 'The Phantom Tollbooth' and the Wonder of Words at The New York Review of Books. I read The Phantom Tollbooth with the Gauthier boys when they were in the early years of grade school. I find it interesting that I gave the book to their twelve-year-old cousin last year, as part of her 'Paperback Book of the Month Club' Christmas present, and she hasn't yet read it. The book doesn't call to her. What We Call What Women Write at The Millions is an interesting essay for a few reasons. The essayist, Deena Drewis, is writing about Pulitzer Prize winner Jennifer Egan's comment in a Wall Street Journal interview that is supposed to have riled some women writers. As a children's/YA literature person, the bit of Egan's original comment that interested me the most was: "There was that scandal with the Harvard student who was found to have plagiarized. But she had plagiarized very derivative, banal stuff. This is your big first move? These are your models?...My advice for young female writers would be to shoot high and not cower." Does that suggest to anyone else that if Kaavya Viswanathan had plagiarized Joyce Carol Oates or Annie Dillard her crime wouldn't have been so bad? It was the plagiarizing that was the issue, not the content of what she plagiarized. That's a whole different thing. On the nonchildren's/YA front, the authors Egan called "derivative" and "banal" were women writers of chick lit. Drewis makes the point that many chick lit writers and fans embrace that term. "Ladies, it’s 2011," she says. "Who refers to women as “chicks” aside from Ed Hardy-wearing man-children? Uninspired as it may be, detractors calling the work “fluffy” can’t really be blamed—it’s built into the name, for god’s sake. It’s difficult to move forward in an argument about the sexist climate in publishing when a group that is supposedly trying to push for more equality has accepted and even defended a derogatory label." This reminded me of the discussion earlier this year regarding the use of kidlit. And, of course, my own never ending complaints regarding the use of the word "girl" to describe women in their thirties, forties, fifties, and beyond. Terminology matters. To some extent, a group will have an easier time getting respect from others if they treat themselves respectfully. Labeling themselves as children or with a word that men used toward young women (chick--young bird--young, inexperienced) makes the job harder, not easier. I had one of my better weeks professionally, at least recently. On Monday I finished that new chapter I wrote and wrote again, and I've been plowing through revisions of later chapters. Today I had to knock off work at noon to start the cleaning and meal prep for Easter. I actually started the cooking last weekend, but the cleaning was just beyond me. Holidays are always an endurance test for me, though Easter is nowhere near as bad as Christmas. One year I can even remember getting things ready in time to be able to take a walk before company arrived. They were waiting for me when I got back, but what that meant was that someone else had to great them, right? So it's unlikely I'll be able to do a little work tomorrow they way I did last Saturday. But things went so well this past week that I'm actually looking forward to getting back to work on Monday. I hope I don't forget this feeling while baking, cleaning, and washing fruit and vegetables. Every now and then I go through the new picture books at my local library. Recently I found two very clever ones by Melanie Watt. As soon as I saw the "Place My Award Here" spot on Chester, I knew to expect some attitude. The book delivers. The publisher describes it as a story told "by dueling author-illustrators." 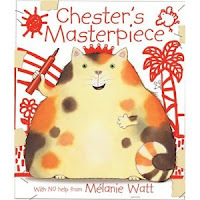 In fact, Melanie Watt becomes a character in the story, a character who is trying to write and illustrate a book that keeps being hijacked by a cat named Chester. I guess a child reader could either consider him to be a real cat who wants to write this book or a character who wants to take over. Either way, Chester is, as he himself says, "Charming Handsome Envy of Mouse Smart Talented Envy of Melanie Really Handsome." He returns in Chester's Masterpiece in which the two author-illustrators continue to duke it out on paper. This time, though, Chester's creative struggle "illustrates" plenty about the writing process. A nice addition to a grade school writing program, perhaps? 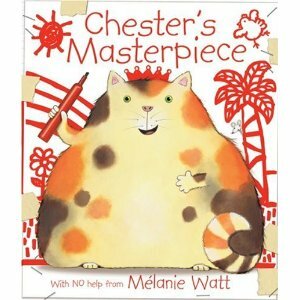 Chester made a third appearance in 2008 in Chester's Back!, though I haven't read it. Plot Project: After thinking about plot these many months for my Plot Project, I have decided that some plots are "organic" in that they grow out of situation, rather than falling into the "What does your character want? How can you keep it from him?" format. The plots for these books are organic. They come out of the basic situation of the author fighting with a character. Today I sent in my registration for the SCBWI's 15th Annual Eastern NY Regional Conference: Out of the Box, which will be held on Saturday, June 11, in Fishkill, New York. This conference called to me because it is only one day, there is something I'm interested in during every session, and it's only a two-hour drive from my house. The length of conferences really is an issue for me. A weekend-long conference or retreat means taking a big chunk of time from family work and home/life maintenance work that may have to be made up somewhere down the line. Making up those kinds of work often ends up coming out of my professional work time. On top of that, being away for a weekend almost always means some kind of prep, some of which comes from...yes...professional time. Also, having to behave myself and be nice to others and do without exercise and reading time for extended periods is very unhealthy for me and everyone around me. It is not a good idea to put myself into those kinds of situations. I live with two other adults and we get along very well because we all go our own way in this house. At a conference, you are not supposed to go your own way. I think that's the point of a conference. You are supposed to confer. So that's why I'm pleased to have found this one-day thing. I can be with other writers for six or seven hours, thinking about writerly things, and then I can head home to do some sun salutations and decompress. And I'll still have half a weekend for life maintenance work--clean a toilet...iron some clothes...make some cookies. I decided I needed to put some new material in the work in progress earlier on. So I've been working on an new Chapter Six for...I don't know...ten years? Twelve? I wish I had some idea when I started the thing. I'm guessing it only feels like ten or twelve years and that in reality it was more like five or six weeks. I did the chapter, and then immediately started writing it over again. And I finished that rewrite less than five minutes ago. One of the problems with a revision like that is that you can't just write an entire chapter of new material as a block and drop it into place. You have to do all kinds of things to the earlier chapters to lead up to the new material and to make sure that you aren't contradicting anything that came before. I was on Chapter Fourteen (I think) when I decided to do this, so I'll need to go over all the material after the new Chapter Six, because the new material is sure to have an impact on everything that follows. But right now I believe that should be relatively easy, and I'm going to continue to believe that until I learn otherwise. Connecticut is getting a book festival that sounds similar to the well established Connecticut Children's Book Fair. I think this is a marvelous idea. I've read of book festivals in other states supporting their resident authors and felt chagrined that my own didn't have one. It also looks as if this thing will be featuring winners of the annual Connecticut Book Award. That's even better. I will try to get there for the Marked & Purged: Writing the Truth for Teens through Realistic Fiction and Fantasy Panel on Sunday afternoon. The dates are May 21 and 22. David Elzey did a piece at the excelsior file on a book called Do You Know What I'm Going To Do Next Saturday? Elzey's recap was laugh-out-loud funny, but he ended up doing a thoughtful analysis of a 1960s era children's book. He did other posts on books written by the same author, Helen Palmer, but this is the one I read the most carefully. His lead-in "One tow-headed boy's laundry list of what he intends to do includes a good deal of eating and pretty large amount of time hanging out with the Marines. Includes gun play." was beyond my power to resist. Last week was not good for either writing or blogging. However, on Saturday I made a trip to a sweet little museum to do some research. The place was far better than I expected it to be. The work in progress has a historical element dealing with a young Polish employee of a thread mill. The Windham Textile & History Museum "preserves and interprets the history of textiles, textile arts and the textile industry," specifically the history related to the American Thread Company's mills in Willimantic, Connecticut. (It had other locations in New England.) The Windham Textile Museum is currently running an exhibit, "Polish Past in Willimantic & Windham," so I've been biding my time and finally managed to shoehorn a trip to the museum into this past weekend's family events. I prefer social history to other types, so I was very happy with the first floor exhibit of Polish memorobilia. But what is so incredibly neat about this museum is that it is three stories, and as you go up you keep being exposed to new surprises. (Well, I was, anyway. Readers of this blog won't be surprised because I'm telling them about it now.) The second floor, for instance, is called Thread Mill Square, and it is an Epcotish (we love Epcot) spot where you can visit replicas of two very different kinds of homes. The door to the Manager's House happened to be closed while we were there. When I opened it, I was quite stunned by what I saw. I just wasn't expecting so complete a room. But what really amazed me was the third floor library. What was so marvelous about it was that we walked up another flight of stairs with no idea what we were going to find, and there was not just the library but people working at tables. It's sort of an archive where people actually do things. We happened to stumble upon two student interns who were cataloging site and architectual plans that had been made while the Willi mill was in operation. One of the family's engineers was with me. He nearly wept. Though I clearly hadn't paid much attention to the images at the Museum's website before going there, I had been studying the historical material. Lots of good stuff there for all you people who like labor history. The museum is about twenty minutes from the University of Connecticut and in the same town as Eastern Connecticut State University. So if you're doing college visits, it's worth a stop. Or if you're going to UConn in the fall for the Connecticut Children's Book Fair, you can hit the Textile Museum, too. On Tuesday, I told you I was mystified by book lists. This morning I discovered that The Guardian, which published the list I was talking about, has a Top 10s series in which "Authors choose their favourite books on their chosen theme." Evidently it's been going on for years, because they've got 389 of the things. I believe in respecting the values of other cultures. If the Brits like book lists, I'm cool with that. I'm not terribly fond of book lists because who needs them? What's the point? Why? Yes, I would be very happy if any of my books made a published list and many, many people saw it. But I would always wonder...er, how did that happen? So congrats to all the authors who made Cat Clarke's Top 10 Books With Teens Behaving Badly. But do any of you know how that list came about? Well, my time following the Battle of the Kids' Books was well spent because my pick, The Ring of Solomon, won. Now I must struggle with the question of how old my niece needs to be before she can appreciate the first in the original Bartimaeus trilogy, The Amulet of Samrkand. I made a fan of my nephew, but he was in college. Rebecca is only twelve. I don't believe I've ever read an actual article by Jessa Crispin, just her posts at Blog of a Bookslut. But her piece, A Sea of Words, at The Smart Set was interesting. For her regular column at that publication she read five books on writing in one week and then mused about them. I have to say that I think books about writing have improved over the last couple of decades. They used to be incredibly deadly, and recently I've stumbled upon some that I found much less so. Nonetheless, five in one week seems a little risky. Crispin did come up with some good musings as a result of the experience, though. She writes quite a bit of the oceans of writers being churned out of MFA programs. "I’m not alone in thinking of the MFA industry as predatory," she says. I only know what I've read about the schools, and maybe they're predatory, making bundles off from young people who, even if they publish, will never be able to truly support themselves with their work or maybe they're just their own culture. They sound like a strange world, perhaps a narrow one, which I think is how Crispin finds the writing life as described in the books she read. For many years after I finished college, I considered going to graduate school. I've written of it here a number of times. Nowadays, I long for a retreat at a writing monastary where I could train with writing monks, work out by myself for an hour each day in an empty room overlooking a mountain meadow, and eat a good meal with a glass of wine next to a fire each evening. No workshops. No public readings. No networking. Crispin's column just reinforced that fantasy. Usually I find McSweeney's to be nowhere near as funny as I get the feeling I'm supposed to think it is. But I did find A Self-Published Author Addresses the Small Gathering at the Launch Party for Her Memoir amusing in a painful (and others may think snarky) kind of way. Though, personally, I think the world may very well appreciate the musings of a single 37-year-old woman who lives with her parents. It would just have to be very well done. Think of it as a challenge.